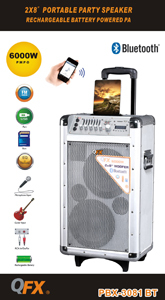 QFX’s Bluetooth Party PA packs big sound with wireless, Bluetooth streaming or USB/SD/FM playback, and 6000W p.m.p.o. pumping through dual 8” woofers and a 1.5” tweeter. Customize your party experience with a 7-band graphic equalizer and remote control. Tell the world who you’re rooting for with the included dynamic microphone and any of three guitar/microphone inputs. With a built-in rechargeable battery, the Bluetooth Party PA is ready whenever and wherever the party leads.